Muhammad Ali – the most outstanding boxing figures of all time (also called “The Greatest”) passed away on June 3, 2016. 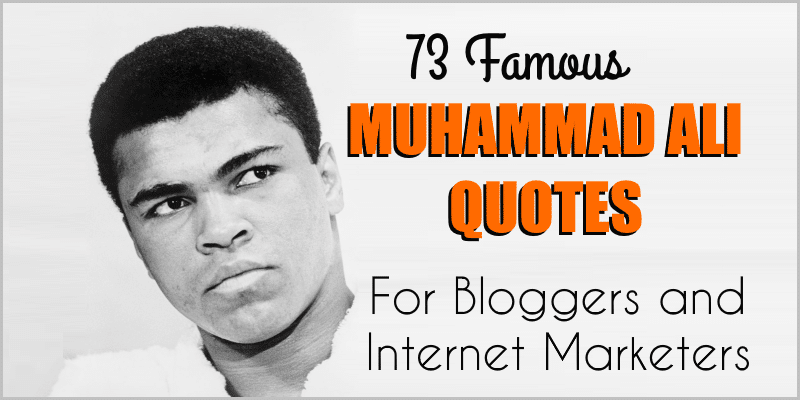 That’s the reason I decided to put together this list of 73 famous Muhammad Ali Quotes for bloggers and marketers. I handpicked only those comments of Mr. Ali that are inspirational for bloggers and internet marketers. And I sorted them to make them easier for you to digest. As you will see, success (be it in sports or business) won’t come easy. Even the greatest champions and biggest legends have to fight and sweat for it. But it’s worth it. As you know well, all these aspects are important for an entrepreneur. And that’s how Muhammad Ali has influenced the world. And that’s how he keeps influencing the world even now when he has passed away. Did you find these quotes being interesting? Inspiring? I did. I got inspired. In fact, I learned from Muhammad Ali. I learn from his work attitude and life values. In your opinion, could Muhammad Ali inspire you? Did these famous Muhammad Ali quotes motivate you to go after your dreams, through thick and thin? Which quote did you like the most? Please let me know by dropping a comment below. Thank you very much.